Mr. Squash and I are getting ready to leave town for a few days later this morning. I though I'd better pick some tomatoes and other things before we go. Usually we ask our pet nanny, who is more than happy to do it while we're gone. With two cats on her hands now, we thought it best to have her spend all her time with them this trip instead. I was not prepared for what I found in the garden! All of a sudden the tomatoes have gone wild! With 6 plants, it's hard to keep up with them even when they're ripening just here and there. I think all the heat and dry weather we've had has given them a massive growth spurt! In front are the last of the blueberries Mr. Squash picked this morning. You can see just a bit of a very large zucchini poking out below. The jalapeno crop is enormous - I was shocked at how many were ready to pick. Speaking of things gone wild, Gracie May popped in to see what was going on while I was taking photos! She knows she is not supposed to be on the kitchen counter. Lots of times I'll be working on the other side with my back to this part of the counter. I'll turn around and find Gracie May sleeping here! Mr. Squash calls her a little Chortek, which I think means devil in Polish! That's putting it mildly, but we still love her! 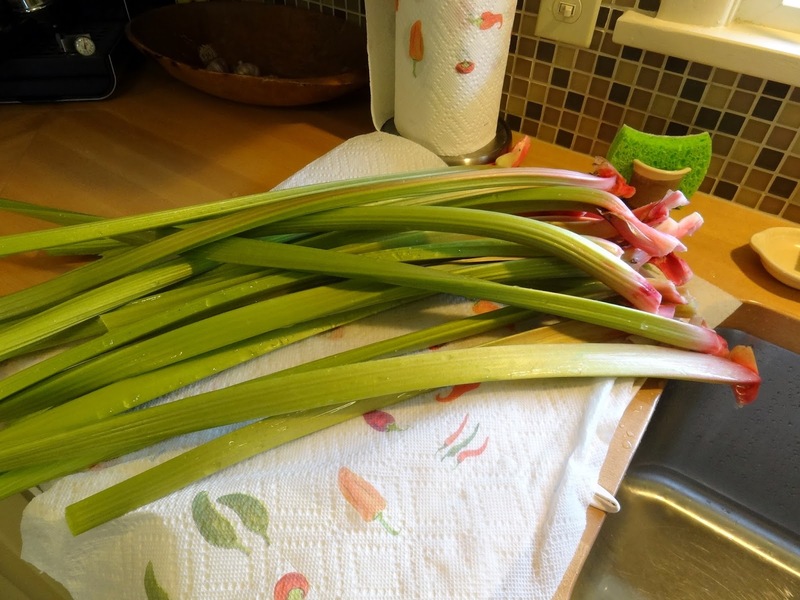 Check out the rhubarb! I cut it all the way down and it just comes right back - kind of like the Energizer Bunny! It will probably keep producing right up to the first frost! We planted some 45 day cabbage in late June. It lived up to it's name and produces wonderful heads of sweet cabbage! We love to make coleslaw with it. When we return from our trip I might just make Golumpki (Polish Stuffed Cabbage). Hopefully we'll be back on Saturday with some fish tales! I'll be over for stuffed cabbage. Your garden produces bounty more beautiful than any grocery store has! We harvested about 4 red tomatoes and maybe a dozen yellow pears tomatoes today. Good looking harvest. the cabbage look great. Have a great trip. Your harvest looks amazing! Safe travels and I hoe you and Mr. S have a great time! Lovely harvest, so colorful and yummy! Have a safe trip, Candace! Oh, I haven't had or made golumpki in forever!! First MIL introduced me to it and she was a great cook. 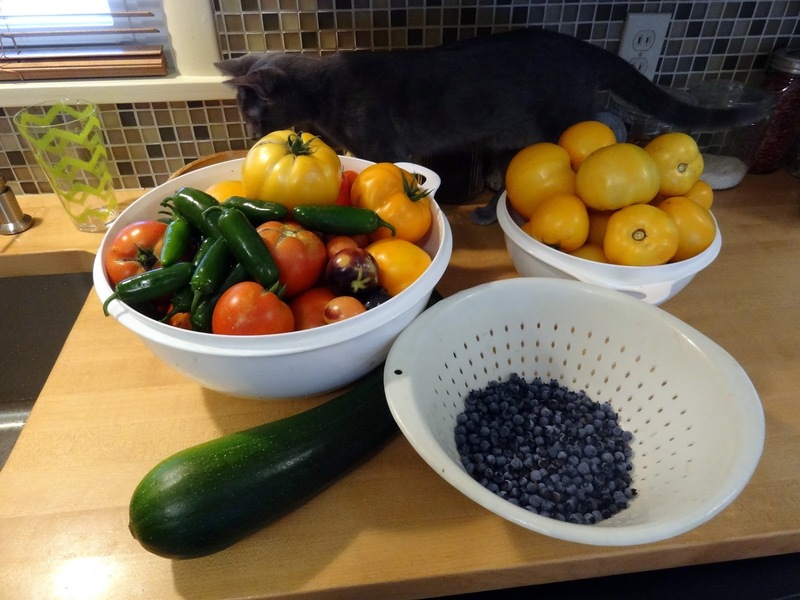 What bounty you harvested from your garden. Now, make yourself a tomato pie, okay? Have a great trip and catch lots of fish. 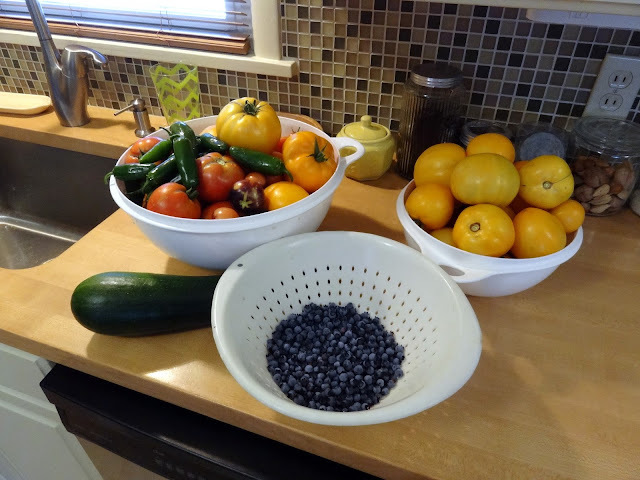 A beautiful harvest! Will you be eating it all before you leave? Did someone say stuffed cabbage? One of my faves! Your garden produce is amazing! I'm sooooo envious! Yep, I'll be over for stuffed cabbage. Everything looks wonderful. THis is just the best time of year. Enjoy your travels! Your garden inspires me to get going around here. Love seeing all of that yummy goodness. Have a great trip. Amazing harvest, this is a reat time of the year. Stuffed cabbage sounds delicious. We usually buy them ready made because it is so much work. Wow, what an awesome garden you have. 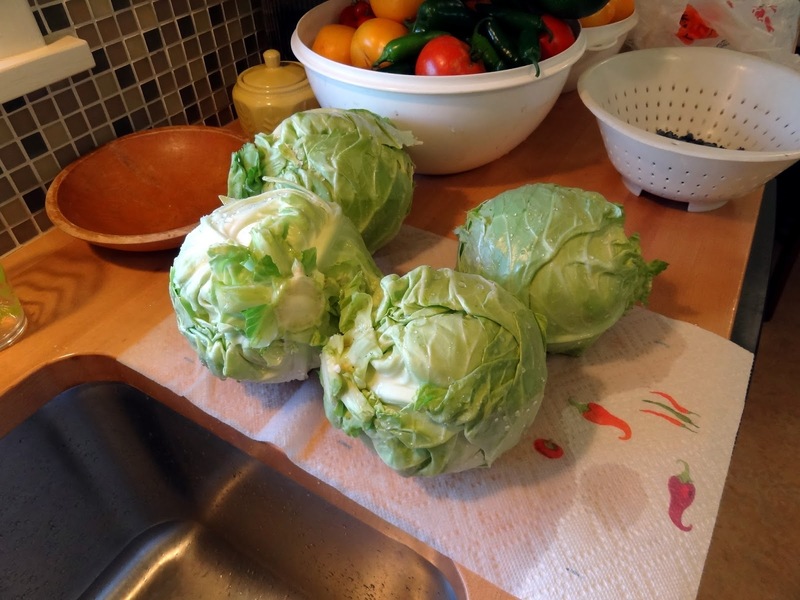 Your cabbage sounds fantastic as well as all the other goodies you've been harvesting!! Love that new computer. Been thinking about an IPad myself as I love my Iphone so much.